This is CAPTAIN BOB. Bob was found hanging around my house, about a year ago. 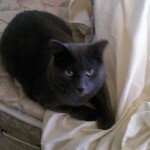 Bob had heard about us from his friends, that we would feed him and pay for his medical bills. This past spring Bob was spotted going fishing. He had a fishing hook stuck in his cheek with fishing line trailing, hence Captain. We took him to him to get this removed & then released him. A few months later he came knocking on our door with a broken tail. We then had to take him to get this amputated, hence BOB. After this incident he asked if he could stay til he had a forever home. 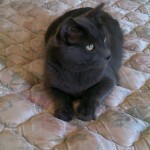 Bob is a solid dark grey (blue) neutered male, approximately 3 years. 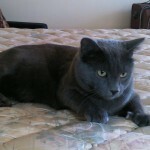 If you interested in Captain Bob please contact us at 314-306-6888 or e-mail us at www.phoenixpack.org for an application.